Here’s a fantastic way to spice up your green beans! This easy caramelized green beans and shallot recipe is ideal to accompany any weight watchers meal. I love veggies, but sometimes, I find it hard to get all my daily servings in without things getting boring. So when I tried this recipe, I was THRILLED! 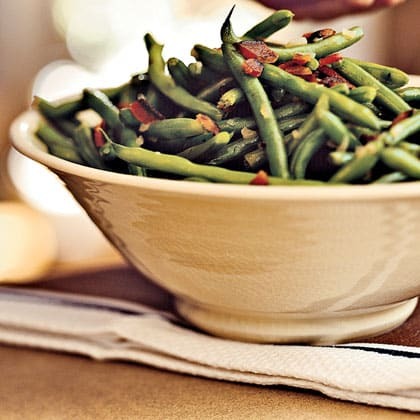 Full of flavor and light on calories, these tasty green beans with shallots and butter and bacon will be enjoyed by everyone. And with just a 1 Point per serving, it’s the perfect weight watchers side dish recipe. Enjoy! In a large frying pan or wok, melt the butter over medium-high heat. Add the garlic and shallots and saute for about 4 minutes. Stir in the balsamic vinegar and cook for 1 1/2 more minutes. Remove from the heat and add in the grated lemon rind, chopped thyme, salt and pepper. Cook the green beans in boiling water for about 3 minutes (or until crisp-tender); drain. In a large bowl, combine the green beans with the shallot mixture and toss well to coat. Great recipe. Too much rosemary for my taste though. I think next time I’ll skip it altogether. I guess I’ll add the bacon bits with the shallots and garlic, then add the the rosemary with the thyme and salt and pepper. My wife just found out about this site and told me about it. We love to have her aunt and uncle over on the weekends and cook something new. We were at our wits end what to make going forward (Since we just started with Weight Watchers). That's until we started browsing this wonderful website. What a great wealth of recipes and ideas.